Let's examine the statements that describe the equation. In part (1) of the statement, we see that an unknown function y(t) is added to its derivative y'(t), which is scaled by two multiplier terms r and c.
In part (2) of the statement, an initial value is assigned to the function y(t). The meaning of this statement is that, when t = 0, y(t) = a. Remember about differential equations that, unlike numerical equations, they describe dynamic processes — things are changing. Remember also that the derivative term y'(t) describes the rate of change in y(t). Please think about this system for a moment. Let's say that the variable t represents time (although the equation doesn't require this interpretation). At time zero, the function y(t) equals a, therefore at that moment the derivative term y'(t) is equal to (b - a) / (r * c). 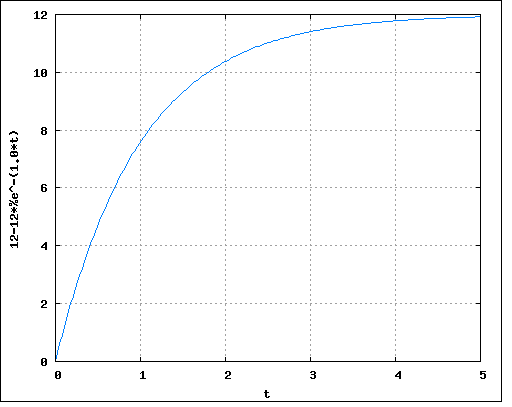 Notice that y'(t), which represents the rate of change in y(t), has its largest value at time zero. Because of how the equation is written, we see that the value of y'(t) (the rate of change) becomes proportionally smaller as y(t) becomes larger. Eventually, for some very large value of t, the rate of change represented by y'(t) becomes arbitrarily small, as y(t) approaches the value of b, but never quite gets there. 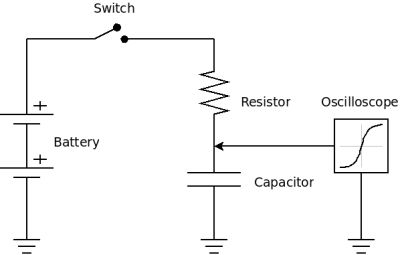 Electronic circuits consisting of resistors and capacitors (hence the equation's terms r and c), where the voltage on a capacitor changes in a way that depends on the current flowing through a resistor, and the value of the resistor's current depends on the voltage on the capacitor. Heat flow between a source of heat energy and a cooler object being heated by it (like a pot on a stove). In such a system, the temperature of the heated body changes at a rate that depends on the remaining difference in temperature between the two bodies. The rate of gas flow between two pressure vessels with a constricted passage between them. In this system also, the rate of gas flow depends on the remaining pressure difference, and the pressure difference declines over time. This is by no means a comprehensive list of this equation's applications. But the statements for a differential equation are only the beginning, and not all differential equations have analytical solutions (solutions expressible as a practical function, one consisting of normal mathematical operations). Others require numerical methods and are only soluble in an approximate sense. Okay, we now have a function that embodies the solution to our differential equation. We can use it to solve real-world problems. Here's an example from a field in which I have spent a lot of time — electronics. In this experiment, we have an electronic circuit consisting of a resistor and a capacitor. At time zero, we close a switch that connects our circuit to a battery, we then use an oscilloscope to measure the voltage on the capacitor over time (see diagram this page). I have to say this trace looks very familiar. Click here to download a Maxima instruction file for this problem and solution. Okay, I see a problem with this solution — the group of terms at the right includes the familiar "e-t/rc" expression that appears in equations with defined initial values. But, because this equation describes a continuous process with no beginning and no end, we need to set the conditions at time zero in such a way that all times will be treated equally (and the right-hand subexpression will be eliminated). Click here to download a Maxima instruction file for this problem and solution. In case this virtual circuit design activity sounds exotic and unrealistic, I should say that modern electronic design has become increasingly dependent on this kind of virtual modeling, well in advance of any hardware prototyping. As computer software become more sophisticated, there is less reason to waste time and material experimenting at a workbench to discover that a design is or is not practical. I found a rather exotic purpose for this differential equation up in Alaska. It turns out this equation applies naturally to the tide-driven movement of water into and out of bays connected to the ocean by narrow channels. 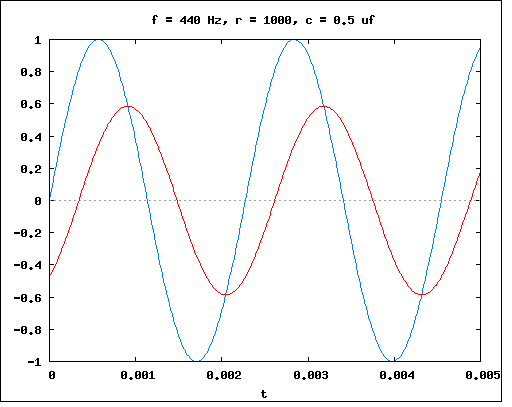 The channel current resembles the current flow in the resistor in an R-C circuit, and the two waveforms in the diagram above resemble the timing and height of the water levels in an ocean-bay system (the blue trace represents the ocean water height and the red trace represents the bay). All one need do is establish time constants for the tidal system, which is nature's corollary to the time constants created by electronic components in an R-C circuit. Of course, in nature things aren't so neat and predictable as in an electronic circuit, with an essentially perfect signal generator and electronic parts with precise values. But the two systems have a lot in common, and it is possible to model a bay's tidal heights with reasonable accuracy using this method.